Time to reflect on St. Florian, the Augustinian monastery outside Linz, Austria, where I spent my last three days. At first it seemed very grim and austere, but by the time I left I felt the urge to return. It has its undeniable charm, and the offerings in the area were far beyond my expectations. The biggest draw, although I did not do it, was the Bruckner Weg, or Symphonie Weg. I described it earlier, but it’s hard to describe how excited I was by it. It combines my love of walking and music! 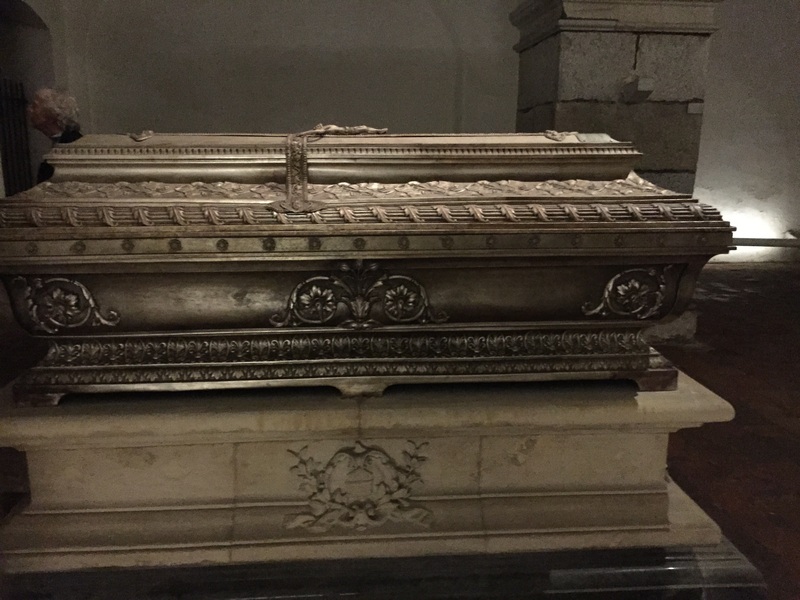 It’s a great way to learn about the music of a composer who was so dedicated to organ music, he wanted to be buried under the church of St. Florian. And indeed, here’s a picture of his crypt in the basement! I was able to discover this grand old monastery and its historical treasures that are now under appreciated and forgotten. 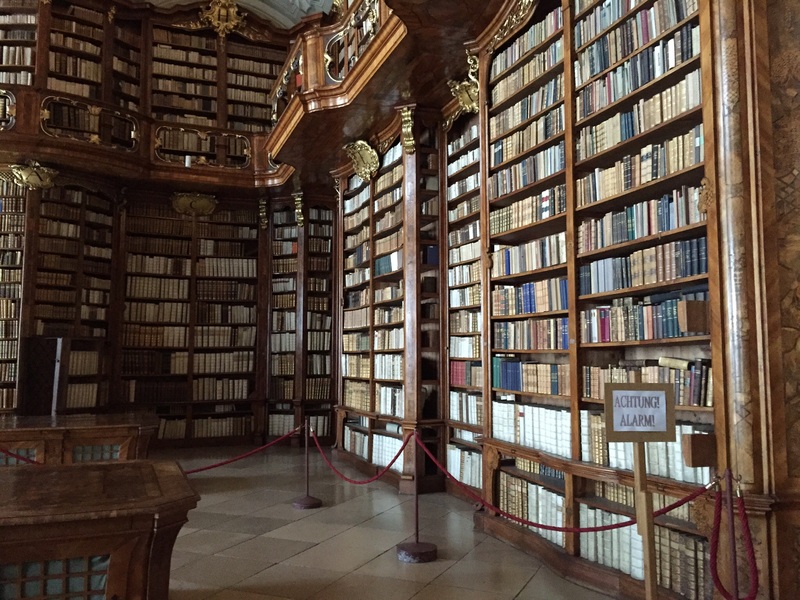 The library holds over 140,000 volumes and about 4,000 are original books before the printing press was invented. The interesting part was about their psyche. It indicated that monks were high on the masculine scale but also had a very high preponderance towards female qualities of neuroticism and detail. Wow. What a combination. I wondered if I was material for monkhood?? Others like him must have suffered some hardship or divine inspiration. The Augustinians also have hermits too, so their monastery is a perfect place to try out the lifestyle. I wondered how Herman’s Hermits picked their name. As the monks left the cathedral, I couldn’t help but study each face. Hmm, older, tall, and pretty handsome for their age. Is that where all the men have gone? I’m searching for my single lady friends. It all starts to come together. All the glorious trimmings at the expense of the people. But it was interesting to see the development of the environment and understand the conflicts that were subsequently caused by it. I mentioned some of the wonderful paths and “wanderings” available throughout Austria and Germany earlier. Switzerland probably has an awesome offering, but I haven’t heard about them yet. 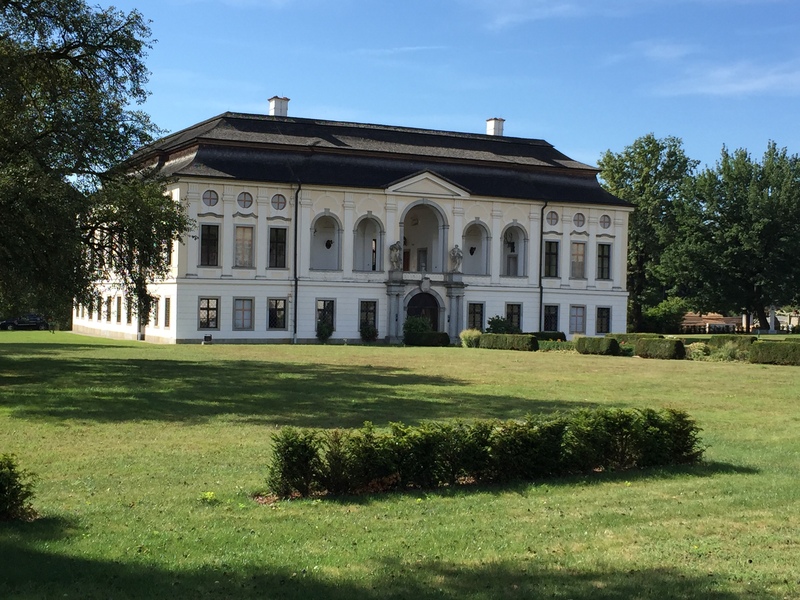 Although I was unable to do Jacob’s Way to Santiago de Compostela (my 19 days were already numbered), the Bruckner Way or the Symphonie Way (the museum at the far end was closed for the month of August), I took a short walk a mile away to the Hohenbrunn Schloss. It was blazing saddles, so I had to shade-spot along the path. Before arriving, I stopped to enjoy looking back at St. Florian in the distance beyond the road (pictured in the header). Hohenbrunn, shown below, is some version of a hunting lodge built between 1722 and 1732. No one was there except me, and for a few quid I could see the entire place to myself, unaccompanied. At first it seemed a little creepy, as it felt like someone had just occupied it and left the water running somewhere. And all those guns. The one I took the picture of was one-of-a-kind. It actually is used for shooting ducks on a boat, so the boat supports the long barrel. I’ve captioned a few of the other photos that struck my fancy as I pranced through. I told them there wasn’t enough room! Grr! If you don’t watch out you’ll end up like me! Despite my digs at the culture in and around St. Florian, it was really pretty sweet. It took a bit of courage and good faith to come here on my own, but I stayed in contact with my support staff. I am nearly half way through my journey, and as many of you know it is not about the destinations but the process of getting there. At times I wondered what I was doing. When I finally played my on-line music appreciation class that I brought along with me, I realized that this is real-time learning. I can hear and relate to music that is being performed. I ironically was at the point of learning about “Baroque” as in Bach vs. “Classical” music by Beethoven. That was awesome! I hope I can convince any of you to come back with me to St. Florian. The surrounding area is luscious and vibrant, and you feel the freedom to explore at your own pace. It’s heavenly to hear the organ and Bruckner here. And yes, I am a little sad to leave.